What do they have in common? The same type of Near Eastern ancestry? From Iran? Nope, that's a joke. Obviously, they share the same type of steppe ancestry. This probably has some very important linguistic implications. The relevant Principal Component Analysis (PCA) datasheet is available here. Below are two pairs of formal mixture models that support my inferences from the PCA. But seriously, what's the direct link between populations like Tepecik_Ciftlik_N/Minoan_Lasithi and Namazga_CA/Dzharkutan1_BA, except some exceedingly distant farmer ancestry from the Fertile Crescent? Excellent work David, appreciate it! Thanks for sharing. How sure can we be that this Iron Age Iranian was indeed an Iranic speaker? How sure can we be that this Iron Age Iranian was indeed an Iranic speaker? He comes from Iron Age Central Asa, which was an entirely Iranian speaking realm, he's essentially a two-way mixture of Steppe_MLBA and Copper/Bronze Age Central Asians, and his type of ancestry makes up about 90% of the ancestry of Pamir Tajiks. So there are no other options, unless Iranian languages were spoken by BMAC people before steppe incursions into Central Asia, and Steppe_MLBA spoke some unknown language that was also spoken in Europe. But this isn't plausible for a number of reasons, including the fact that there's no direct, unambiguous link between BMAC and European Indo-Europeans, except of course Steppe_MLBA, which influences BMAC at its tail end. @Davidski Thank you. I was wondering, is this sample in your Global 25 Datasheet? Yes, should be. Look for Turkmenistan_IA. Not only linguistic implications, it explains many common elements in Indo-Iranian, Greek and Slavic cultures like poetry, religion etc. In my opinion common elements in Indo-Iranian, Greek and Slavic which we see in languages, poetry, religions etc. came from the culture which existed around 3000 BC in the forest-steppe area between Vistula-Dnieper-Don. There was a very interesting Bronze Age civilization there whose culture, poetry, religion etc. influenced enormously Eastern-Europe, India and Greece. It probably didn’t originate in the steppe but rather in the forest-steppe as a mixture of R1a dominated steppe herders and Neolithic farmers and later spread into the steppe and through the steppe reached other regions. This forgotten civilization is more important than PIE which is highly speculative and very uncertain. It's very difficult to explain early Corded Ware without the steppe, because of the high ratio of CHG to EEF, basically as high as in Yamnaya. Early Corded Ware was basically, and probably in reality, Yamnaya, and from somewhere near the Caucasus. We can't get away from this no matter what. Darn it, site ate my comment! David: this would indeed be revolutionary. You say the Mycenaeans were descended from Srubnaya. And that Srubnaya was proto-Iranian. But these two things are obviously incompatible: because we know for certain that Mycenaean was not Iranian, but Greek. So there are two options: either the Mycenaeans did not speak Greek, or the Srubnayans did not speak Iranian. On the first: we know the Mycenaeans ended up speaking Greek. But it's possible that they were an Iranian-speaking invader class who were assimilated by their Greek subjects. Notably, the early attestations come from a scribal class, not the rulers themselves. But there's also no actual evidence of this putative Iranian tribe in Greece. By the time we get names, these are recognisably Greek, not Iranian. And if the Srubnaya invaders spoke Iranian, where on earth - given the already small percentage of steppe ancestry in the Mycenaeans - did the Greek come from!? So it seems much more likely that the other end is wrong: Srubnaya didn't speak Iranian. And Srubnaya didn't speak Indo-Iranian. Rather, Srubnaya must have spoken Graeco-Aryan. Which would be massive, because it would require Graeco-Aryan to be true. But it would also throw out everything we thought we knew about timelines. Because it's generally thought that Sintashta is already Indo-Iranian, centuries before Srubnaya. If Graeco-Aryan still hadn't broken up as late as Srubnaya, then that hypothesis goes out the window - and it's such a neat hypothesis! What's more, it puts a lot of pressure on the Aryans. Because, in turn, if Srubnaya is ancestral to both Greek and Iranian, but we know Iranian is closer to Indo-Aryan than to Greek, that means that Andronovo cannot be Indo-Aryan yet. At least at first (maybe it develops Indo-Aryan later on). But that doesn't give us long to have the Indo-Aryans already established as a largely-assimilated ruling class in Turkey by 1400BC!! If the Mycenaeans and Iranians were descended from Sintashta, that would be nice. But if they're both descended from Srubnaya, that throws everything into chaos. So a third option emerges: how absolutely sure can you be that the common ancestor was Srubnaya specifically, and not an earlier Steppe group? “It's very difficult to explain early Corded Ware without the steppe, because of the high ratio of CHG to EEF, basically as high as in Yamnaya. We don’t know the language and the religion of Yamnaya. Maybe they were PIE, but we don’t really know what it means now. All those old theories of PIE were based on cephalic index, glottochronology and phonological reconstructions which are all highly speculative and very uncertain. I am not really interested in PIE because I don’t think it will be solved during my lifetime. I would like to understand common elements in Greek, Indo-Iranian and Slavic cultures and religions which are not based on speculations and reconstructions but on real facts. I marked in red the probable migrations to India and Greece. The migration of Hyperboreans to Greece didn’t come from central Asia but rather from the same area from which it went to central Asia. These migrations fit your PCA and explain similarities in poetry, religion etc. between Indo-Iranians, Greeks and Slavs. @Dave: "what's the direct link between populations like Tepecik_Ciftlik_N/Minoan_Lasithi and Namazga_CA/Dzharkutan1_BA..?" Obviously those people that traded Lapis Lazuli (Afghanistan) and Turqoise (Korashan, near Namazga) to BA Egypt and Mycenae. The only culture N of the Caucasus partaking in that trade was Maykop. "(19) Sum. sí-sí 'horse' ↔? Akk. sisium 'horse' ← Hurr. issi(a) 'horse' ~ PIE *h1ekwos 'horse'; Hitt. aśuwas; CLuw a-aš-šu; Skt. áśva (अश); PIA. *aĉwa-; Lat. equus; Alb. sasë. Probably borrowed into Sumerian from Hurrians, who populated the northern parts of Mesopotamia from ca. 2400 to the first millennium BC. It is unclear from which Indo-European language Hurrians borrowed the word, but the source language had definitely underwent satemization, thus being most likely of the Indo-Aryan group." Hence, satemisation, and presumably formation of Indo-Aryan, must have occured prior to 2400 BC. In fact, the Hurrian capital of Arkesh shows archeological continuity from ca. 3000 BC onwards, and has yielded clay figurines of domesticated horses dating back to the early 3rd mBC, so satemisation most likely already commenced in the late 4th mBC, i.e. within Yamnaya. Alternatively, the direction of borrowing was from Hurrian and/or PNC *hiĉwi into PIE (PNC "ĉ" -> PIE "k" was, acc. to Starostin, a regular reflex). This would remove the temporal constraint on satemisation, but OTOH imply horse domestication south of the Caucasus (either Alikemek, or Central Anatolia). @Watrel: "You say the Mycenaeans were descended from Srubnaya. And that Srubnaya was proto-Iranian. But these two things are obviously incompatible: because we know for certain that Mycenaean was not Iranian, but Greek." He did not explicitly say this though and Mycenaeans and Srubnaya are pretty much contemporary anyway. What the data show that Mycenaeans and the (probably rightly) assumed IA Iranian both can be feasibly modelled as a mixture of Srubnaya + earlier locals from the region where they lived. This does not necessarily means that the Mycenaean founders are an offshoot of Srubnaya, it can be common ancestry. The steppe ancestors of Myceneans could have split from the ancestors of Iranians before Srubnaya was formed. Or they were just intermixed neighbour cousins to begin with. Nice sub topic about how language divergence times fit around whether the steppe into Mycenaean and (reasonably putative) early Indo-Iranian is from the Steppe_MLBA cultures. Sintashta culture seems too late for any proto-Graeco-Armenian-Indo-Iranian language. (Let alone Srubnaya). If the culture is dated to 2100-1800 BCE, earliest attestations of Mycenaean Greek in Linear B are 1400 BCE. Seems too late? (Earliest Mycenaean is already too Greek for a language only separately diverging for less time than Portuguese from Italian?). Even trees that postulate a proto-Graeco-Armenian-Indo-Iranian* require separation into Graeco-Armenian and Indo-Iranian by 2500 BCE, which is if anything late stages of Yamnaya and Corded Ware culture. For example, Ringe and Warnow's tree (usually the go to tree for folk who are reasonably a bit skeptical of the class of trees by Gray, Atkinson, Nicholls, Bouckaert and Chang) - http://www.cs.utexas.edu/users/tandy/Swadesh-Warnow.pdf (page 29) - estimates divergence of Graeco-Armenian and Indo-Aryan at 3000 BCE, which coincides with Yamnaya or Corded Ware, but not at all any of the Steppe_MLBA cultures. (This Ringe-Warnow tree features an almost parallel divergence of all languages which are not Anatolian or Tocharian at around 3000 BCE. it's not really a tree supporting ideas of a phase of unity of Graeco-Armenian and Indo-Aryan for any time at all after divergence from other IE. In fact there is no such tree discovered that I am aware of using any method of computational linguistics that attempts to put dates around these things.). 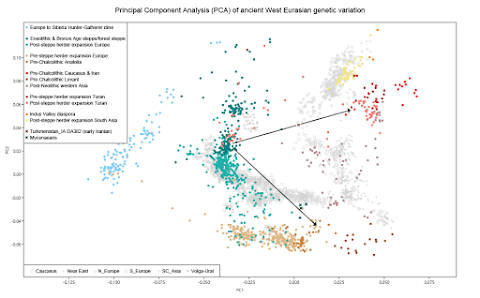 *and trees based on root meaning traits of course reject this as a clade, while, when done properly by Chang, also showing divergence of Graeco-Armenian from all other IE languages around 3000 BCE. @FrankN, that loan is an interesting argument for indirectly dating satem language divergence (if there is such a thing) in the absence of direct attestation. Srubnaya is too late, isn’t it? How well does Sintashta fit? About the same, but I'm using Srubnaya because the fit is better, and indeed exceptionally good for Turkmenistan_IA. Of course, as per Slumbery's reply to Wastrel, this is just shared steppe ancestry of the same type as Steppe_MLBA, and it need not be Steppe_MLBA. That's not a problem because we know for a fact that Steppe_MLBA-like people already lived on the steppe as early as the Eneolithic (Sredny Stog II). There's no point in modeling Mycenaeans with any populations that didn't exist in the Balkans and the Aegean region during the Bronze Age. So look at the data that are available and be more realistic. And obviously horse domestication couldn't have happened south of the Caucasus, because the modern domesticated horse lineage can be traced to Eastern Europe now via several lines of evidence. So again, look carefully at the available data and be more realistic. For years the comments here were hijacked by a few people who couldn't handle the facts and so they tried to derail every discussion with their own fantasies. I want to get away from that sort of climate now, so please keep that in mind when posting here. "Early Corded Ware was basically, and probably in reality, Yamnaya, and from somewhere near the Caucasus. We can't get away from this no matter what." 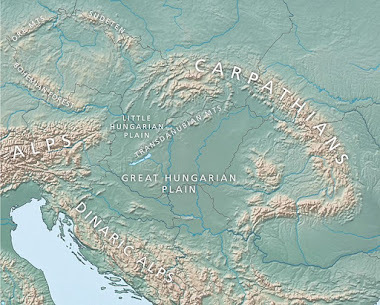 I've seen in other places the idea that it Indo-European entered central Europe via the Danube basin and then formed the Bell Beaker culture, and that the Corded Ware instead represented either an earlier Indo-European branch or a non-Indo-European substratum. Is there any way of testing between these two ideas yet? Other places? I don't think there's much genuine debate anywhere whether Corded Ware was Indo-European. You're probably referring to kooky Carlos' ramblings in which he claims that Corded Ware came from the western edge of the steppe and was Uralic speaking, while the preceding cultures in the region, like Cucuteni-Tripolye, were proto-Uralic. The fact is that the early Corded Ware people were genetically like Yamnaya, and some were almost indistinguishable from Yamnaya. We still don't know yet whether Corded Ware was a subset of Yamnaya, or derived from practically the same Eneolithic steppe population, but it was either one or the other, and ancient DNA will soon clear that up. They were definitely early Indo-Europeans, and probably spoke a host of extinct Indo-European languages, as well as those that eventually gave rise to Baltic, Slavic, Indo-Iranian, and to some degree Germanic and others. As far as I understand it Proto-Indo-European most likely started forming +-6000 BCE till 4000 BCE when it started to brake up. So any languages spoken in the Pontic-Caspian Steppe region during that time could have contributed to the formation of Proto-Indo-European. It's still current, even though many new samples relevant to the topic have been published since. Thank you for the response. I agree that it's very unlikely that Cucuteni-Tripolye could have been Uralic (how would it even get there in the first place?) so it does kind of fall apart when you put it that way. The place I got it was indo-european.info, which I guess is kind of a mixed bag? Their tree for the Indo-European languages is probably right and fits with this post as well, but on the other hand there's also a lot of stuff that doesn't really fit either. What with there being a lot of new info from genetic data I'm not always really sure which sites are better to follow and which ones are just fringe stuff, so thanks for clearing things up. I think that the Multi Cordoned Ware Culture (KMK) is the best candidate for the steppe ancestor of the Greek speakers. It existed at the right time and place to have been displaced into the Balkans by Srubnaya, maybe after mixing. They may have spoken languages ancestral to at least some of the paleo-Balkan languages including Greek. This would have occurred by about 1800BCE at the latest, a couple hundred years before Mycenaean is attested. We don't have any genetic samples from this culture that I know of, correct me if I'm wrong. It may be that due to mixing or shared ancestry Srubnaya is currently the closest proxy we have to KMK. This could explain how Srubnaya can be Iranian speaking, yet genetically related to the steppe component in Mycenaeans. The Multi Cordoned Ware Culture (KMK) is a good candidate for the proto-Greeks. No samples yet from the KMK, except a couple of mtDNA sequences from burials associated with the Babino culture. Forget what haplogroups they belong to off the top of my head, but nothing informative. @FrankN: Horse domestication south of the Caucasus seems extremely unlikely; horse bones are relatively scanty (but not absent or hugely rare) south of the Caucasus, and no one in the field of bioarchaeology really advocates for domestication there, and support for domestication in a north of the Caucasus steppe environment is universal (as far as I know). Still, there is ancient dna in the works on horse bones south of the Caucasus from Central/Eastern Turkey, and maybe that will turn up something surprising. (See: https://www.researchgate.net/profile/Benjamin_Arbuckle - "I am also currently involved in a multi-disciplinary projects exploring the origins of domestic horses in Anatolia" and https://archaeology.sites.unc.edu/home/rla/research/equid-exploitation-and-horse-domestication-in-ancient-anatolia-benjamin-arbuckle/ - "We seek to build a detailed, diachronic, collaborative, multi-disciplinary, interpretive framework that will allow us to: (1) define the nature of the newly discovered, intensive exploitation of equids (including horses and hydruntines) on the Anatolian plateau, (2) rigorously evaluate the roles of autochthonous domestication and importation in the appearance of domestic horses in the region, and (3) contextualize equid hunting and herding in ancient Anatolia with a focus on understanding the social processes responsible for the origins of this transformative animal technology. These broad goals will be achieved through the recovery, dating, and analysis of zooarchaeological, paleobotanical, isotopic, and ancient DNA datasets from four sites in central Turkey dating from the Early Chalcolithic to the Iron Age (6000-1000 BC). This project provides the first opportunity for a comprehensive analysis of the social and biological processes responsible for the emergence of domesticated horses in the Near East ". But to repeat myself, south of Caucasus domestication seems extremely unlikely on the academic consensus. @Dave: "There's no point in modeling Mycenaeans with any populations that didn't exist in the Balkans and the Aegean region during the Bronze Age." That statement of course also applies to Srubnaya, which, beyond being linguistically unfeasible, was more or less contemporary to Mycenaeans, and retrieved from Samara Oblast, at almost 4,000 km distance from Mycene. [For comparison - Areni Cave [Armenia_CA) to Mycene is ca. 2,500 km]. Some people, e.g. Narasimhan e.a. 2018, find it useful to not only use proximal, but also distal sources in their modeling. If you disagree with them, fine. However, your reply to Phillipe suggests that you regard Srubnaya as a proxy for a distal Steppe source that may go back in time as far as Sredny Stog. That statement of course also applies to Srubnaya, which, beyond being linguistically unfeasible, was more or less contemporary to Mycenaeans, and retrieved from Samara Oblast, at almost 4,000 km distance from Mycene. That's very funny. But no, Balkans_BA I2163 from southern Bulgaria and dated to 1750-1625 calBCE is basically identical to Srubnaya. I guess you're not too good at taking hints, because my post above was a warning. You're now banned. Don't ever try to post here again. This is really just a side note, but Samara is something like 2700 km from Mycenae and the western/south western reaches of Srubnaya are actually not farther from Mycenae than Armenia. Not that this technicality is terribly important (let alone decisive) to the question, but at least easy to abain geographical data should be get right when one criticizes a theory. Oops- did I miss anything here? Gaunitz e.a. (2018) have shown that Botai horses were of the Przewalsk horse type, and as such not ancestral to most modern horses. Hence, modern horses must have been domesticated elsewhere. Multifold domestication seems likely, given the contemporary appearance of Botai and non-Botai horses. This leaves a variety of possible domestication locations: Ukrainian steppe (HT 4), Anatolia (HT 3), Arabia (HT 1), Turkmenistan (HT 1), also Iberia. ”It should be noted that our dataset does not include populations west of Ukraine. (..) The modeling framework used here is not well suited to deal with the complex demographic histories experienced by horse populations in central and western Europe; the role of these areas in horse domestication can therefore not be confidently established here. Whereas central Europe is unlikely to have played an important role in horse domestication due to a lack of suitable wild horse habitat (9), there is increasing evidence that horse domestication may have also occurred in the Iberian Peninsula (9, 10). The same caveat naturally also applies to areas south of the Caucasus, and south of Kazakhstan (i.e. Iran, Turkmenistan) that, except for West Georgia, were also not sampled. As their modeling did not include any scenario for domestication south of the Caucasus, their study can*t rule out such possibility. What may be derived from it, however, is that the Western Steppe most likely was one of several areas of (secondary?) horse domestication – most likely HT 4, but apparently, as the Mayaki horse was still wild, after ca. 3,500 BC, i.e. later than Botai (and also Baalberge) already possessing domesticated horses. So far on counter-arguments. Positively, we have Alikemek Tepesi (E. Azerbaijan) as likely domestication location, acknowledged, e.g., by Anthony. Stratigraphy suggests intensive horse exploitation there since the early 5th mBC (Dalma pottery horizon). Bone analysis by French researchers is under way – let’s wait and see what they will come up with. And the B. Arbuckle mentioned by you, Matt, is in the “Oxford Handbook of Ancient Anatolia”, p. 695, credited with having supplied fresh data that “raises the tantalizing possibility of an independent center or horse domestication in Anatolia”. Again, let*s wait and see what ongoing research will yield. @Dave: Only noted your ban after I had posted my answer re. horse domestication. Your hint at the likeness of Balkans_BA I2163 to Srubnaya is relevant and interesting. I wasn't aware of it (had opverlooked that Graeco-Aryan post). Had you made that relation clear from the beginning, i.e. already in the original posting, I would surely have commented differently. IE entrance into Greece from Thrace makes sense, and, for the record, I never doubted the "late PIE Ground Zero" in the Steppe. My issues are/ were about Anatolian languages, Anatolian-Italic isoglosses, and PIE-Sumerian language contacts that all call for a more southerly original PIE Homeland. Still, aside from that Balkans-Srubnaya IE link, there is an earlier, archeologically well evidenced connection between the Aegaean and BMAC via the Caucasus (Kura Araxes), clearly via the Levante (KA-derived Khirbet-Kerak), Cyprus and the Eastern Mediterranean, maybe also overland through Anatolia, and that connection seems to be genetically present as well. @Slumberry: In fact, I made a reading error, mistaking a "3" for an "8". Google Maps has 3,389 km from Spiridonovka, Samara Oblast to Mycenae (peasant mode, including ferries) - as the crow flies it should be somewhat less. Burials and other rituals usually went hand in hand with sacrifice of a Domesticated Animal and usually its placement in the grave. This goes back to at least Early Samara in the Pontic-Caspian Steppe. Are there any evidence elsewhere that can point to Non-Domesticated animals being used in the same way ? If not then why sacrifice horses in this way if they were not domesticated already ? A big chunk of Persian ancestry might come from Tajick-like people from central Asia, a big chunk of Turkish ancestry might come from people of mixed Sintashta/Lokomotiv like ancestry from central Asia. Interesting. @David, which Mycenaean exactly is this? 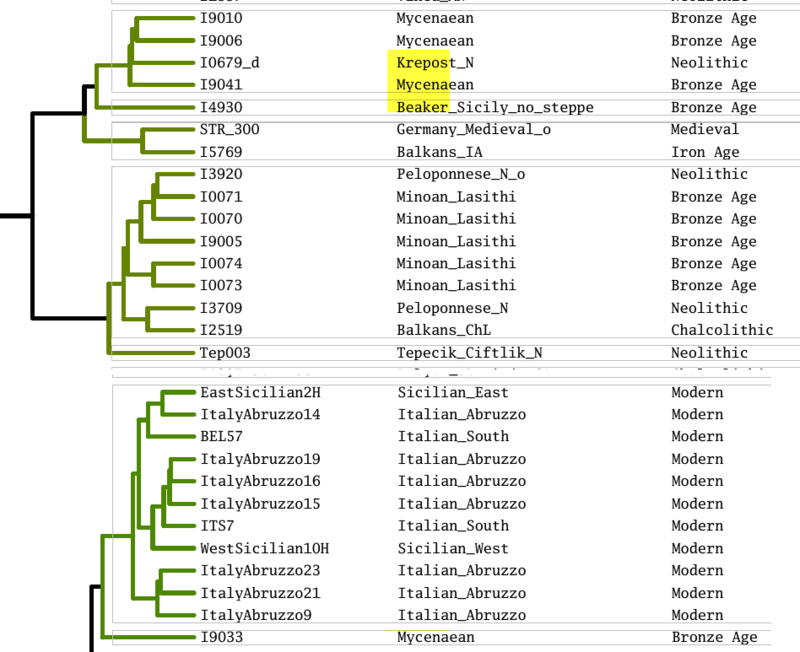 While I can get DA382 from Iron Age Turkmenistan (Zarafshan) as a straight mix of Bronze Age BMAC and Steppe, I can't get the I0933 Mycenaean who clusters with the South Italians to show any Steppe without an additional "African" component. Is this the right Mycenaean? @Ric Hern: "Are there any evidence elsewhere that can point to Non-Domesticated animals being used in the same way ?" At Loschbour, remains of aurox, hart, red deer and wild boar were found. They apparently didnt belong to the Loschbour man burial, but to a nearby, several centuries older cremation of a female. Shell middens often contain inhumations (e.g. Portugal, Ireland, Denmark, San Francisco Bay), and are interpreted as residues of burial feastings. Several of them contain further faunal remains from these feastings, e.g. sea mammals (Torres Straits), or at Indian Knoll, KY, white-tailed deer, raccon, and possum. The collective graves of the Wartberg Culture (North Hesse & Westphalia, ca. 3,500-2,800 BC) frequently contained jaw bones of wild mammals, especially foxes. ".. Burials sites all contain Horse Bones." As was the case at Mayaki (btw probably not Sredny Stog, as per my above comment, but Lower Mihailovska Culture, a CT offspring). And the horse remains from there were found to be non-domesticated by Wutke e.a. "Earliest horsehead sceptre": Zoomorphic representations don't tell us anything about the domestication status. Otherwise, we need to assume that the first horses were domesticated during the Paleolithic around the Lascaux cave, and that Mycenaeans had domesticated the lion (https://en.wikipedia.org/wiki/Lion_Gate). So far there isn’t any clear piece of evidence for domesticated horses in the Western Steppe during the 4th mBC. This doesn’t mean such evidence may not show up some day, especially with further testing of horse aDNA. In fact, I am certain it will come up sooner or later, because the Botai horse's trail into Central Germany during the 4th mBC should have lead through the (forest) Steppe. However, at the moment the Western Steppe doesn't excactly look like the epicentre of horse domestication, rather like a region of later, secondary domestication. All of the Mycenaeans fall into the same cluster and have the same type of steppe ancestry, albeit at somewhat different levels. The different signals that you're seeing are probably the result of different levels of coverage and noise, because they can't be confirmed with formal stats. One with three Mycenaeans is similar to the Minoans from Lasithi and the Peloponnese Neolithic, alongside an individual from Tepecik Ciftlik Neolithic, and the other has the Mycenaean outlier I9033 who clusters with South Italians from Abruzzo and a couple of Sicilians. The clustering masks some subtle differences between samples that can be seen in nMonte, being an overall "average". However, I think the first group does in fact have some steppe, but the outlier does not seem to. The outlier does seem to have ancestry somehow related to Africa. Having the ancient Egyptian mummy JK2911 from Pre-Ptolemaic Egypt 769–560 BCE in Global25 I think might help clarify matters. Notice that including all regions shows a signal from East Africa for some reason (which also shows up as Iberomaurusian when other parts of Africa are restricted, with a greater distance), but here, Sintashta is 6.0% and surprisingly Parkhai Middle Bronze Age (BMAC) is 7.2%. There is also a strong CHG signal here. However, even if this is not a signal and just aDNA damage, I9033 should be separated out from the other Mycenaeans. In any case, the Mycenaean outlier should be labeled as such. Can you rerun your Mycenaean statistics leaving out I9033? @Ric Hern: One additional thought - often, consumption of domestic animals that aren't primarily kept for their meat is tabooed. Examples are Indian "holy cows", cats in ancient Egypt, cats/dogs in contemporary Europe (while there is archeological evidemce of dog slaughterhauses from Roman period Gaul), and the recent British "horse meat" scandal. Against this background - isn't the omnipresence of disarticulated horse bones in 4th mBC western Steppe burials, in stark contrast to the complete absence of horse remains from Yamnaya (and also CW) burials possibly signifying a major shift in cultural attitude towards the horse? Once (wild) hunting prey on the Steppe, now (domesticated) a valuable means of transport .. These Mycenaeans have somewhat different levels of the same components, as well as different levels of coverage. This is what you're seeing in your analyses based on the Global25 coordinates. But there's no strong evidence that these Mycenaeans have different origins, that they're not closely related, and that they don't cluster together. You would need to demonstrate this with multiple lines of evidence, including formal stats, but I don't think it's possible based on my work with these samples. Do you know that a horse can be ridden without a Bit or Saddle ? Done it myself so..Anyway. We see horses being bred for Meat and Milk production even today. So do horses need to be Wild to use them as a foodsource or as measure of wealth ? Wouldn't it be advantageous to domesticate your main foodsource in a place where human population kept growing significantly and many different tribes migrate through or into your territory, in order to assure some kind of foodsecurity ? Horseheaded Sceptres can not really be used in comparison with Animal Carvings of Lascaux which represented many different animals. The horseheaded sceptres seems to have been used to point to some kind of authority figure within the society not just some random carvings. The use of horses in a different way doesn't necessarily point to it not being domesticated before that time. Different ways of use of the horse could point to the fact that cattle and sheep became more readily available as foodsource and some other uses could be found for horses. @Ric Hern: "We see horses being bred for Meat and Milk production even today." In Botai, horse milk residues were found in pottery encrusts, providing clear evidence of domestication. Such evidence is yet lacking from the Western Steppe (but, as I have said, it may still come). The horseheaded sceptres seems to have been used to point to some kind of authority figure within the Society So what? Maybe the authority stemmed from being the best horse hunter..
Look at the following scepters. What do they tell us about domestication of the depicted animals? Anyway, I am out now. Dave has been patient enough after my ban. Yes only time will tell. Cheers. I feel I should point out, relating to the first topic here: we don't know this person spoke an Iranian language, no, not at all. It's probably not even a better than 50% chance. I'd accept a better than 50% chance that he spoke an INDO-Iranian language. But there are at least three surviving II language families - Indo-Aryan, Iranian, and Nuristani. Indo-Iranian as a whole would presumably have been spoken somewhere around that area, sure - but we have virtually no knowledge of where the borders between the three branches would have been at that time (even assuming that there weren't more than three branches originally, which there probably were). To recap: Indo-Aryan is attested from around 1,400BC, in Turkey and Syria. It's then attested again in northwest India from around 100BC (it's assumed to have been there over 1000 years at that point, but there's no direct evidence of this). Iranian is attested from around 400BC, in southwestern Persia. Another language is indirectly attested in reports from Greece about fifty years earlier, which ascribe the language to tribes from eastern europe - this language is assumed, for reasons of historical simplicity, to be an early form of Iranian, but given the small number of words and the fact they've been filtered by rumour and Greek phonology, it's impossible to pin them down as Iranian on linguistic grounds. As for Nuristani, I don't know when it was first attested but probably not until a few hundred years ago - the current Nuristani population looks like a relict protected by terrain, but how large their original territory might have been or when they lost it is completely unknown. So 800BC in Yaz, long before any Iranian attestations anywhere, let alone in that area, at a time when at least three II branches are known to have been wandering around, nobody knows exactly where? No, nobody could seriously confidently say they must have spoken Iranian, even if that's probably the safest default hypothesis. We can't even be sure they were II. Yes, II is the only surviving IE branch in that part of the world. But it's not the only branch that could conceivably have been there in the past. Tocharian is not attested for another 1,500 years, and historical observes thought they had relatives west of the mountains, so they could well have been in Turkmenistan (although I suspect they weren't). Interestingly, iirc they look surprisingly II genetically, given their early linguistic branching - they could have been neighbours to the later II migrants. Another obvious option is Armenian. Armenian isn't known to have been spoken in Armenia until around 400AD. ["Armenia" existed by at least 400BC, but all we know of the language spoken there was that the Greeks thought it sounded like Persian]. Or of course there could have been moribund branches of PIE. If, for instance, this guy was particularly closely related to the ancestors of the Greeks... maybe he spoke "Eastern Greek", a language family that has vanished without trace (as most language families have). Remember: outside the middle east, and maybe Greece, these genetic records you're dealing with VASTLY predate any linguistic records. And languages can change very quickly. Consider, for instance, the linguistic map of Europe in, say, 2000AD. Lots of Indo-European languages. But almost all of them have vanished without a trace. Almost the whole of Europe now speaks a descendent of Proto-Slavic (spoken by a small tribe in the marshes around 800AD), or Proto-Northwest-Germanic (spoken by a small tribe somewhere near Jutland around 200AD), or Proto-Romance (spoken around 400AD, though we happen to have some earlier forms ('Latin') attested, unlike the other two). The great fabric of IE languages that were spoken across the continent for the preceding two millennia have disappeared almost utterly. The same is likely to be true of IE in central asia.